A nuisance until they get the taste of blood in them. Velonacula, more commonly referred to as Velos or Dustrunners, are agile reptilian pack hunters with bone razor hands that are a known hazard found throughout the forests and deserts of Aeldos. Growing up to 1.5 meters in height and 2.5 meters in length, and weighing up to 80kg, they are known for their hit and run and pack hunting tactics. Dustrunners are dull witted and bestial carnivores that sit in the middle of many ecosystems as both predator and prey and possess only one notable trait; the blood-frenzy. Velos packs can be troublesome to the unprepared or the easily panicked, but not to most well armed caravans or travelers. 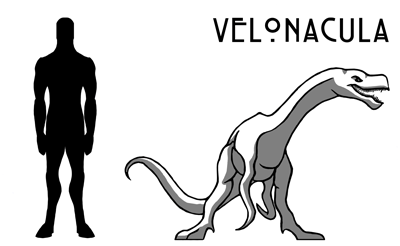 Velonacula or Velos are bipedal therapods with sinuous muscular bodies, long powerful legs with sharp claws, and forelimbs that are fused into a single bony talon. Individual specimens can grow to roughly the size of an adult human, with males growing somewhat larger than females. The colouration of the feather-scaled skin of the Velos range from blue-black in coastal areas, to mossy green in forests, to rusty red and pale in deserts. Albino specimens have also been observed. The alternate name, Dustrunner comes from their exceptional speed and agility as the species can easily outpace horses over short distances and leap up to four meters vertically. Velos have faces similar to that of other reptiles, with a long mouth filled with sharp teeth and eyes raised above their snouts to allow them to bury themselves in wait of prey. The species has average senses, with their primary sense being smell, which they use to track prey over long distances. Velos are not considered particularly intelligent and are primarily motivated by instinct. Some travelers claim they can be distracted by decoys and stunned by bright lights and others that their attention can be redirected temporarily simply by throwing dried meat rations to them. This latter technique is considered dangerous though, as the species is rapacious, rarely satisfied with a few slips of jerky and apt to pursue the provider in search of more (and gut them if none is found). Because of their limited and apparently cold-blooded intelligence Velos are known to continue fighting even when they should flee, making engagements more damaging for victors than with other animals. Velos hunting tactics tend to favour ambush and hit and run tactics, strafing prey with their sharp claws and talons and either retreating to wait for victims to be weakened by blood loss before attacking again, or dragging sufficiently wounded prey away from the pack to gorge. During gorging, Velos frequently enter a state known as ‘blood frenzy’, becoming stronger, more vicious, incredibly aggressive. This enhanced state makes the species far more dangerous, and the majority of fatalities sustained by Velos attacks occur as a result of this heightened state. Velos have several natural weapons: sharp teeth that leave gouging wounds; powerful legs with piercing claws; a whipping tail that can knock prey to the ground; and the fused bone-talon forearm that is as dangerous as any short sword. While Velos are particularly gifted in offense, the species has few natural defenses and prefers to rely on speed to avoid attacks. Velos are opportunistic predators who hunt a variety of prey. When possible they prefer large meals on which to glut, but they are not above insects, fish, and eggs when hungry. The species itself acts as prey for other more dominant predators including Gulogar, Faeles, Grommen, and Tyrn. Velos operate in packs of 5-8 and are typically led by the largest member of the pack. They appear to communicate via croaking and barking sounds and non-verbal cues that are fairly simple and demonstrate minimal social complexity. Velos reproduce via clutches of eggs and are fiercely defensive of their dens. Little else is known about their reproductive habits. Velos can be found in the jungles, forests, and deserts of Aeldos and, though they demonstrate no particular fear of humans they do keep to the more distant parts of these domains, avoiding direct conflict with human settlements and preferring to prey on travelers and wanderers. Velos domestication is difficult but not impossible, though they are rapacious and become uncontrollable while in a frenzy, making them less than ideal for most purposes. Most attempts at “taming” the species are undertaken by Ossandrians seeking to use them in the arena. Though the species eggs are considered a delicacy to some, their meat is tough and unpalatable. Their skins can be used for crafting and some enterprising folk have repurposed their resilient forelimbs into bone short-blades.